I’d like to read to you a short bible story about Jesus, and the scribes and the Pharisees, and an adulterous woman. The reading is from John chapter 8, verses 2 thru 11. Follow along in your own bible if you’d like. Whatever Jesus was teaching, here’s what happened next, beginning in verse 3; “And the scribes and the Pharisees brought a woman caught in adultery, and having set her in the midst, they said to Him; Teacher, this woman has been caught in adultery, in the very act! Now in the law, Moses commanded us to stone such a woman. What do you say? Can you picture it? Here’s Jesus sitting down, and all the people who have come to Him, they’re probably sitting there all around Him, and they’re listening to His words, and here come the scribes and the Pharisees, and they march right in, and get right in the middle of everything, and they set the woman right “in the midst”, as the scripture says. You’ve seen people like that. No manners, no thought for anyone else that was there, they just march right in and get right in the middle of things, because they had an agenda. But the people had gathered to hear Jesus. They knew there was something special about Jesus. In the previous chapter, chapter 7, and in verses 40 & 41, the people were saying; “This certainly is the prophet. Others were saying; This is the Messiah!” And in verse 46, some officers from the temple said; “Never did a man speak the way this man speaks.” People sensed that it was important to hear what Jesus had to say. What was the “good portion” that Mary had chosen? The “good portion”, or in other words, the “one thing which is necessary” was to hear the words of Jesus. That’s all that really matters; Hearing the words of Jesus. Right now, all of us sitting here right, are doing the only thing that really matters; We’re hearing the words of the bible, the words of Jesus. That’s really all that matters. Even though we might be anxious and troubled about a lot of things. Just one thing matters. Their whole purpose was to try to find fault, and guilt in Jesus. We don’t know for certain, what they thought the could accomplish here, but it’s been inferred, that if Jesus had said not to stone the woman, then they could accuse Him of going against the law of Moses. And if He agreed to stone the woman to death, then they could accuse Him of going against Roman law, which said that the Roman government was the only one who could put someone to death. So they thought they had Jesus in a trap, with no way out. The scribes and Pharisees didn’t care one bit about the woman that they brought before Jesus. They certainly didn’t care about her heart. But you might say, Well, that woman’s heart was definitely in the wrong place, who cares if she gets punished! Jesus cared, didn’t He? Jesus not only cared about her heart, but He cared about her soul! And it’s a good thing that He cared about your heart, and about your soul, and my soul. Because if He didn’t care, we’d all be lost! If we hadn’t been given the chance to repent, where would we be now? So then let’s not judge someone by the fact that they’ve done something wrong; We’ve all done something wrong. Let’s look at a person’s heart, and remember that even if a heart, is in the wrong place, it can change. God gives everyone the opportunity to repent. I wonder if we should give everyone the same opportunity? The scribes and the Pharisees were asking Jesus to make a judgment, and the scripture says; “And they were saying this, testing Him, in order that they might have grounds for accusing Him. But Jesus stopped down, and with His finger, wrote on the ground.” That seems like a strange thing to do. Jesus had obviously gotten up when the scribes and Pharisees came in with the woman, and they put this question to Him, but then He stoops down and writes on the ground. What did Jesus write on the ground? The bible doesn’t tell us what Jesus wrote. But I know one word that Jesus might have wrote, that would fit this story perfectly. It’s a word that Jesus used several times in addressing those Jewish religious leaders. And the word is “Hypocrites”. “Scribes and Pharisees, hypocrites!” So, maybe that’s what Jesus wrote in the ground that day. I’m not saying it was, but it could have been! It certainly would have fit. 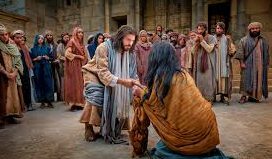 Remember how Jesus had been teaching a crowd of people who had followed Him into the temple courtyard, and how the scribes and Pharisees had brought the woman into their midst. Well, even though the scribes and Pharisees had left, I’m sure the crowd was still there, and had witnessed everything. And now it was Jesus and the woman in the midst, with the crowd all around. And you just know, that everyone was waiting to hear what Jesus would say next. I know I would have been. Why didn’t Jesus condemn the woman? He knew she was guilty. He knew she had sinned. But instead of simply condemning her, He gave her the opportunity to repent. Jesus said, in John 3:17; “For God did not send the Son into the world, to condemn the world, but that the world should be saved through Him.” What a lesson for the woman, and for everyone in the crowd that had come to hear Jesus teach! Thank God, for His mercy and His patience, and His forgiveness. Jesus said; “Go, and from now on, sin no more.” Isn’t that exactly what He tells us to do? Go and sin no more? And it’s been fulfilled in your ears as well. Go, and sin no more. Behold, now is the acceptable time; Behold now is the day of salvation. If you’ve not been saved yet, now is the time, and today is the day. Hear His word, and believe His word. Take this opportunity, to repent of your sins, and to confess His name, and to be buried in baptism for the forgiveness of your sins. Today is the day, and now is the time, to be forgiven, and to sin no more! ← Karma, Luck, or God; Where Have You Put Your Faith ?